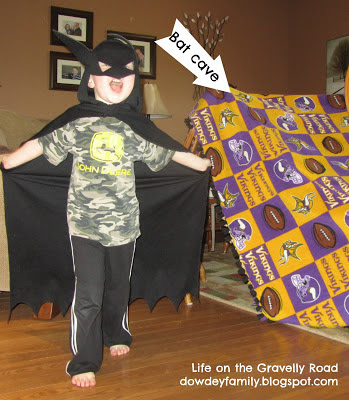 As I posted on FB, he was playing batman in his batcave/fort and the ongoing dialog was just too much. Son: "Mom, I took my special bat cape off so I can sleep, but don't worry. I don't keep my special super powers in my cape. I keep them in my tummy". Me: "Oh, what do you eat to make super powers in your tummy? Spinach?" Son: "No Mom, I eat granola!" Few minutes later... "Mom, I put a special a-guise [disguise] to look like the bad guys so I can sneak up on them and they won't organize me"